Obby is one of those great places on the internet(we are biased yes,) but although it’s a beautiful place to book classes, we aren’t just a pretty face. We do serious business behind our gorgeous interface. Behind the front page and the carefully curated lists of classes, we work closely with our partners to ensure their businesses are a success. Employment in the UK creative industries has grown to 2 million but it’s not easy to make a comfortable living. We know first hand that surviving in a growing and competitive industry is difficult, especially for makers and creators. The statistics are difficult to read, with almost a third of the visual and applied artists earning less than £5,000 a year from their creative work. At Obby, we feel like we are a great platform for makers and creators to run workshops in their spare time, teaching their incredible talents to the creatively curious. We sort all the advertising and business side of things, and after the roll out of our exclusive partner dashboard, it takes little more than 10 minutes to upload a class onto Obby. We do this, because we enjoy it for a start, but also because we have a passion for the creative industry, and we love to see it thriving. This is why to us, it is great when we find someone who does the same. Turning Earth is an incredible company that has started in London after inspiration from across the pond, in America. 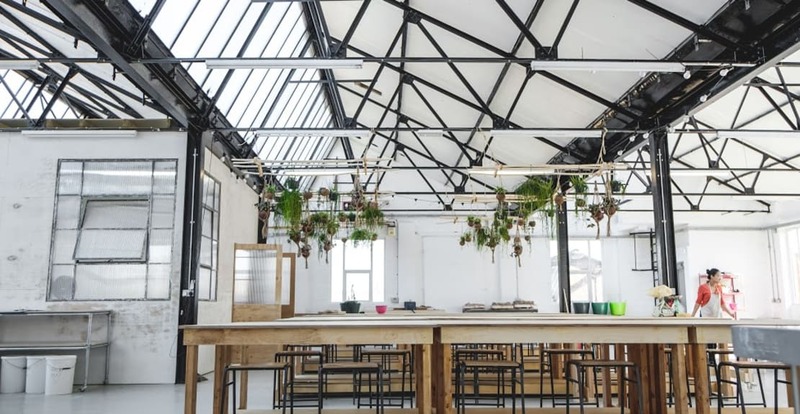 They have opened two open-access studios in central London, where keen pottery enthusiasts or makers can rent a space for 15 hours a week to create their art. It means they aren’t tied into having their own studio, they can keep it casual. Pottery wheels are not only expensive, but the process of using them is extremely messy, meaning you can’t just plonk one in your living room. Turning Earth provides a place for these people to flex their creative muscles, working alongside other like-minded people at a time that suits them. It’s a no brainer really, and let us tell you, it is a pretty spectacular place. We caught up with Tallie, one of the great minds behind Turning Earth to find a little more about the whole process, and how this amazing idea came about. This is what Tallie had to say. Tallie: Turning Earth is a ceramics maker space where part-time makers at all levels – from beginners to professionals – work alongside each other. We have two spaces – one in railway arches in Hoxton, and another in a beautiful saw-toothed factory space in the Lee Valley. Obby: We love what you are doing but how did you come up with the idea, was it from personal experience? Tallie: Yes – I’d seen studios a bit like this all over America while working there and thought London was a sad place without one. Obby: Go on, spill the beans, tell us the whole story? Tallie: After working hard at university thinking I wanted to be a poet, and then an academic, I found myself in the corporate world as a sustainability consultant. I was bored out of my mind and disillusioned. I decided to take a course in pottery at Hackney Community College because I wanted to do something more directly creative. I picked up the clay and got on the wheel and I had one of those memorable, life-changing moments of clarity. I felt like I’d been alive for a thousand years as if I had been throwing pots for lifetime after lifetime. It was the first of many visionary experiences I’ve had in a ceramics studio. Part of me wanted to be a potter, but I had another big part of my personality that wanted to do something organisational. I didn’t want to have to choose. I felt angry that the UK seemed to offer only two choices – either do evening classes and dabble but don’t really get into it or quit your job and do a three-year degree. It seemed to me (and still does) that I didn’t want to either be an artist or not be one. I didn’t want to choose; I wanted to do both. I wanted a hobby studio that was good enough that I could turn pro if I wanted to. One day, on the Stanford Campus, throwing a set of plates on the shores of a dried up lake, under the California sun and surrounded by agapanthus and hummingbirds, I had the idea for Turning Earth. It came out of my own moment of perfect happiness. I then went on a tour of the US, working as a theatre manager, and was able to try out ten different studios in five different States. I studied each of them and stored up the best elements for Turning Earth. One, in particular, Mudfire in Atlanta, Georgia, gave us the membership model that makes everything work. Long story short, I – inspired – moved back to the UK and started looking for a place to set up. It took about a year. I started reaching out to other people who wanted the place to exist as much as I did and built a community around it. We crowdfunded the studio and sold places in advance. And now there are hundreds of people that use the studio every week, many of whom graduate to becoming full-time professionals without having to take the college route. Many others just use the place for therapy. Obby: So how does it work? If I were wanting to come make a pot, with no experience, how would I go about it? Tallie: Well, if you had no experience at all, we’d recommend you take a course before becoming a member. Memberships include any-time access to the studio (up to 15 hours a week), but you are not supervised. You don’t need much experience – we mix all the glazes and do the firing for you, for example – but it’s good to have had an introduction to working with clay. Courses last for 12 weeks usually, by the end of which you will be confident to use the studio on your own. People who are really enthusiastic can take up a membership alongside a course, and improve really fast (most of the skill in any craft comes, after all, from lots of practice). Also, people who have done ceramics in the past but feel a bit rusty, or who want to learn a new skill can always ask for a one-to-one tuition session with one of our team – this is discounted for studio members. And there’s always someone in the studio who you can ask for help and support. Obby: And what about if I am an experienced potter or ceramicist? Tallie: Experienced makers who want to work part-time can join the studio as members straight up and get stuck in. The main Turning Earth studios aren’t set up for production making, and can only accommodate makers for up to 15 hours a week, so we have also created a separate space, called ‘In Production’, for those that want more storage for their work in progress, independent use of kilns, and unlimited access. You’ll find out more about this once you’ve signed up as a member and everything will become clearer. It’s a super easy process, like a community. You’ve just got to take the first step. Obby: Do you hold events where people can come and buy items made in Turning Earth? Tallie: Yes – we hold a quarterly market. We open the studio for a weekend and invite the public in to browse. We usually have about 60 makers participating, and we put on live music and sell street food. It’s always a festive atmosphere and a great place to visit. We will also have a gallery opening in our Lee Valley centre at the end of the summer. This will mean that we have a permanent space for people to come to visit and purchase ceramics, which is very useful for our members as its a guaranteed chance to showcase their products to interested parties. Obby: Great, whens the next event? Tallie: We have a few events on the horizon. We have a two-day studio sale coming up in our Hoxton arches on the 7th and 8th October. We will launch the Turning Earth Gallery at our Lee Valley centre in Argall Avenue on 20th October. And then we will have a massive Christmas Market on the Argall Avenue site on the first weekend of December. Stine Dulong joined Turning Earth in January 2014, after completing a community college course in ceramics. Previously employed as a corporate lawyer, she was a driven entrepreneur ready for a career change. Through Turning Earth she was able to pursue ceramics seriously, but on a part- time basis, while she developed the skills she would need to go into production, and was able to support herself through her former career in the interim. Turning Earth gave her the space, the facilities and the support she needed to build her own line of ceramics, SkandiHus. While at Turning Earth, she trained to become a teacher, which gave her a supplemental income stream in a related area to her new business and enabled her to transition to supporting herself through ceramics alone. Stine now has over 40,000 followers on Instagram, and sells to the public directly through her website. She has stockists across London and in several other European cities, including Paris and Copenhagen. Clients include chefs Tom Kerridge and Jamie Oliver. Stine has recently taken on a lease for her own production studio, where she employs two other artists from Turning Earth to help her make her products. She continues to teach beginners, which gives her reliable income while she scales up her business. Tom Kemp joined Turning Earth the day the doors opened, on 1st December 2013. He’d already been practicing ceramics for a couple of years and was demonstrating unusual talent at throwing using the wheel. Since then, he has regularly used the studio for two days a week and developed rapidly. He sold work for the first time at the first Turning Earth studio sale and was pleasantly surprised to find that his work was very popular with the public. In September 2015 he joined the social media platform Instagram where he started posting videos of his work process online. These were an instant hit, and word quickly spread about his feed. He now has over 100,000 followers, and is one of the most viewed potters on Instagram anywhere in the world. Due to his success on Instagram, he now travels the world teaching ceramics and has been able to quit his job. He joined the Turning Earth professional incubator, ‘In Production’ when it opened in March 2017, and is a committed member of the community – often sharing his skills with the other makers. Check Turning Earth out here, and big thanks to Tallie from Turning Earth who did this interview with us!